You are currently browsing the tag archive for the ‘Seattle’ tag. We wait patiently here in the Pacific Northwest for the clouds to break. Our gray winter skies can be monotone at best. We don’t get any more rain than my hometown of New York City, but we have long stretches of cloud cover and we say bye-bye to the sun for many a day. Yes, we get SAD (seasonal affective disorder); we are in essence starved for light. Waiting for the sun to break through is a great Seattle winter pastime, supplemented with drinking warm beverages, reading books and watching movies. So look up, and if you’re lucky enough to catch a patch of blue… smile. Seattle has blown it. A Pacific Northwestern cityscape that in the past was of uncluttered venues, a fringe of evergreens and recycled debris bins on many street corners. 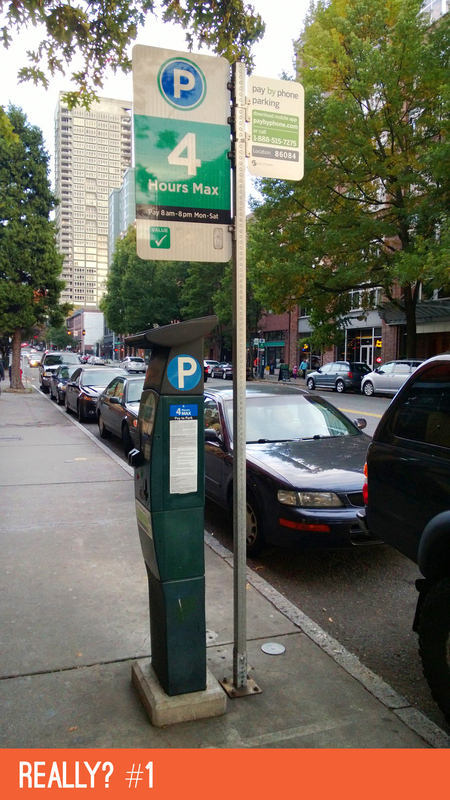 In the brief span of the past couple of years we have lapsed into a parking-pay-system mania. Complicating itself every step of the way… how could it be when the idea was to streamline, make it green, user friendly, and efficient? The result has been 6-foot hulking towers, 1 to 3 of them per downtown block, enough instructional signage to bewilder, and enough add-ons to create an eyesore. We now have an obstacle course of signposts and equipment. Each site has hundreds of instructional words incorporated into it… it’s informationally numbing. We may just fall into apathy about our streets, or it may inspire us to ask for better… design for a solution that will make our streets a desirable intersection of urban culture. 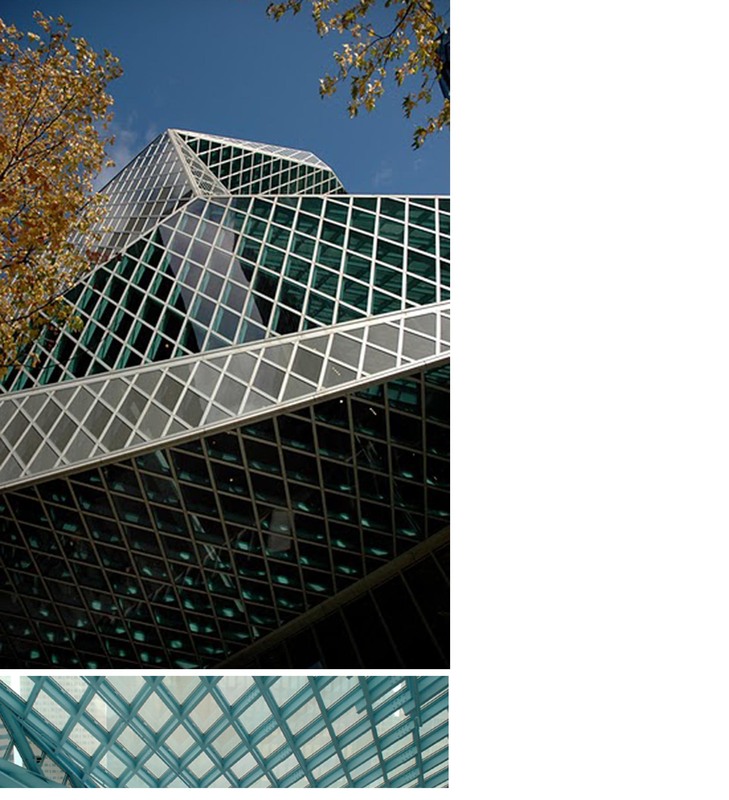 I’ve been itching to say it since we started writing this blog… Seattle has the best library system in the US! Well just look at it, need we say more. The head librarian got everything single thing she and her committee asked for and more… and it came in under budget. The Central Branch is just the tip of the iceberg… which by the way it looks a little bit like when you approach it some city avenues… it’s only one of many newly constructed or refurbished neighborhood libraries in Seattle. Each environment is comfortable, user friendly and architectural inspiring. They all do an incredible business; each is a true community hub. Just look around it’s where the action is. They shuttle books around from one location to another at your whim with such efficiency… I think they put Amazon to shame. I’ve been reading that coffee is having its third wave in the USA. This time it speaks to traditional roots and the purists at heart (no flavorings, please). Portland’s Stumptown Coffee Roasters is now in Manhattan, and so the wave may span coast to coast. This traffic sign always intrigues me….the iconic visual description of the narrowing road. The intended meaning is initially confident. Touché sign designer. THEN, for me, the idea morphs into an entirely different abstraction that has a contrary meaning. Using the line segments as road edges… and then narrowing the road with an angle… and some of these signs have an added element, a dashed line to express the ending of one of the lanes. You get the picture. But the “lines”… the road edges have gotten very fat, thick as walls on a house and the dashed line really looks like 3 stacked rectangles, maybe 3 windows. The slant becomes a roofline and the single lane at top looks like a chimney. It’s a 3 level house to me. The forms are breaking down to their basic abstract shapes and the conclusion can be left to your imagination. If you were to pick your favorite would you choose the deer crossing? Graceful. Leaping across a field of yellow. With the addition of a sticky dot changes the roadscape near the holiday’s… presto… Rudolph. Very literal in comparison to the narrowing road scenario don’t you think? You call it pro bono, a phrase derived from Latin meaning “for the public good”… on top of that, without charging for it. But around here we call it “doing good”. It’s an apex of humanity. It comes in all forms… from simple random acts of kindness to giving your own blood. For a designer it often means offering visual communication skills to amplify a message that you believe in. Sometimes you identify with the cause, and sometimes it pushes beyond your usual comfort zone… helping in situations outside your comprehension. Here’s one we did for Safe School’s Coalition here in Washington State.